Affordable roofing services in Peoria by the professional contractors at Arizona Roof Rescue. As one of the major suburbs of Phoenix, Peoria is a popular place to live. In fact, Money magazine named it one of the “Top 100 Places to Live” in a 2008 issue. The city is the spring training grounds of the San Diego Padres and the Seattle Mariners, and it is home to many historic properties. The city continues to grow, and real estate continues to increase rapidly in value. Arizona Roof Rescue is here to help you keep your Peoria home in top shape, whether you are interested in re-roofing or need emergency roof repair. Every roofing contractor on our team is fully licensed and certified, and has been working in the industry for years. You can trust the work we perform each and every time. When your roof leaks, prompt repairs are essential. Otherwise, even a small leak can lead to huge problems for your home, such as extensive mold growth or rotting. The team at Arizona Roof Rescue is available 24 hours a day, seven days a week to repair your roof as quickly as possible after you notice a leak. We won’t just stop the leak. We’ll thoroughly inspect your roof to make sure we get to the root of the problem and provide long-term protection for your roof and your home. One Of The Best Companies! We also provide the routine maintenance your roof needs to discover the problems that can lead to leaks. Regular maintenance can prolong the life of your roof and keep your home protected. If your Peoria roof is getting older, a trusted Phoenix Valley roofing contractor from our team can also talk to you about the best options for re-roofing your home. We provide a full range of roofing choices to our clients, such as shingle roofs or tile roofs. Foam roofs are also an excellent option for commercial roofs. We service the Peoria area including several towns such as Acacia Grove, Sun Valley, 61525, 61603, 61607, 61615, 61630, 61637, as well as most parts of Arizona. 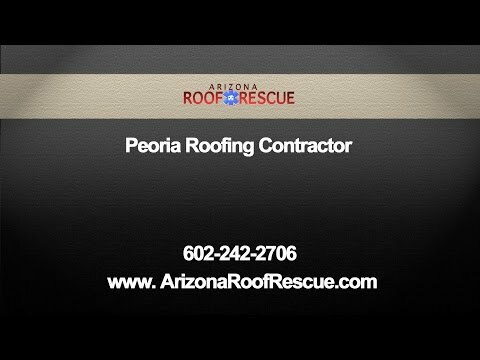 Call Arizona Roof Rescue today to find out how we can help your Peoria home. Even though roofs sometimes need to be replaced, there are cases when they can also be repaired. Trust the professionals at Arizona Roof Rescue. Experienced Roofing Contractors in Peoria are easy to find when you contact Arizona Roof Rescue. Arizona Roof Rescue can get the job done right. Your roof can take a lot of damage during monsoon season due to the strong winds and rain. Arizona Roof Rescue has top rated services for your home or business. Headquartered On The Peoria Glendale Boarder!